The higher one falls on the org chart, the more influence that person likely has (or is perceived to have). And teams fall in clusters across that org chart, reporting up the chain in different places. Regardless of the company, industry or job, chances are many of us can relate to this scenario in some way. So, where should a training department logically fall in the landscape of an organization? Throughout my career, I have worked for companies where training was centralized and reported to an Operations department. I have also worked for a company where training was a bit more nomadic; our team was shuffled around several times until they eventually found the most logical “home” for us (yes, it was a confusing time…we actually referred to ourselves as Training Gypsies). I have also worked as a one-woman show, providing training support for a specific department, reporting to the director of that department; there was no training “team” at all. An army of trainers existed throughout the company, each supporting a different department, but there was no consistency or solidarity…but it did make us all deep subject matter experts in our respective areas. Advantage: We report to the EVP/Chief Human Resources Officer, who reports directly to the CEO, so we are visible to decision makers at the top. Disadvantage: We report to the EVP/Chief Human Resources Officer, who reports directly to the CEO, so we are visible to decision makers at the top. Build strong relationships UP, DOWN and ACROSS your organization. Seek out your stakeholders and subject matter experts, and seize every opportunity to engage leaders at all levels. At the end of the day, it shouldn’t matter where your “org chart real estate” is located…just make the most of your space. 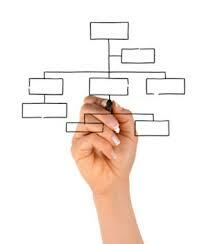 Your turn: Where does your role/team fall on your company’s organizational chart? What are the advantages and disadvantages you have experienced? Be sure to leave a comment – your thoughts are always appreciated!